Thiru Karvanam Sri Thirukkaar Vaanar Temple dedicated to Lord Vishnu located inside the temple premise of Sri Ulagalanda Perumal Kovil, Kanchipuram. Sri Ulagalanda Perumal Kovil has the significance that this temple enshrines three Divya Desams – Thiruneeragam, Thirukkaragam, and Thirukaravanam in its precinct. Without water, the World cannot survive. So, he comes to the World as rain and make all the things to survive. So, Sriman Narayanan explains that he himself is the black clouds which gives the rain for the humans and all things to survive. So, this perumal is called as "Thirukkaar Vaanakkalvar". 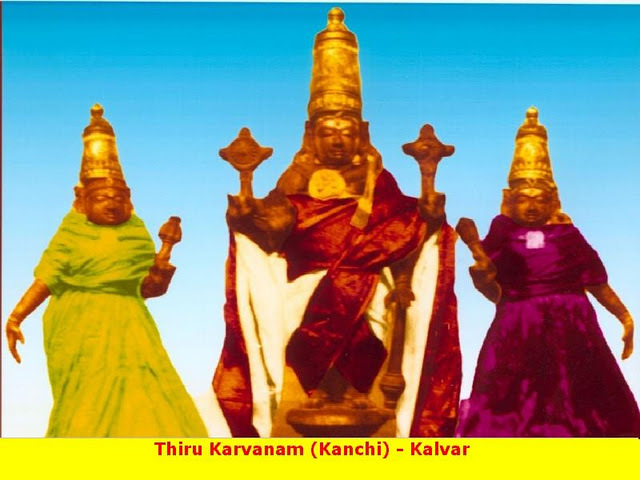 The temple is open from 07:00 a.m. to 12:00 noon and from 04:00 p.m. to 08:00 p.m.
3 kms from Kanchipuram Bus Stand. On the way to Kamakshi Amman Temple. This Divyadesam is found inside Ooragathan Temple.